Sometimes it’s hard to draw a beautiful picture from an astrophysical concept. Even when the subject is stunning the image can still be pragmatically plain, completely byzantine or, while handsome, simply do not engender a deeper understanding. I was going to write a bite about the scientific impact of this classic paper, one often cited as the first in a long lineage of a wholly new take on galaxy evolution. I’ll draw from that source, but looking carefully at it, there’s a deeper joy in the eyes of the reader, and of the authors. Two brothers, Alar and Juri Toomre, thought up an intriguing use for an obscure new tool. They took two galaxies and they put them into a computer, and found a new and rare numerical beauty. This image, like almost every from the paper, is rich with detail. I’ll explain everything here bit by bit as we go, but for now look at this as simply six images of the same central galaxy. Each one, casually rotated to some new angle, a feat almost mundanely simple with a computer, but almost unthinkable without. 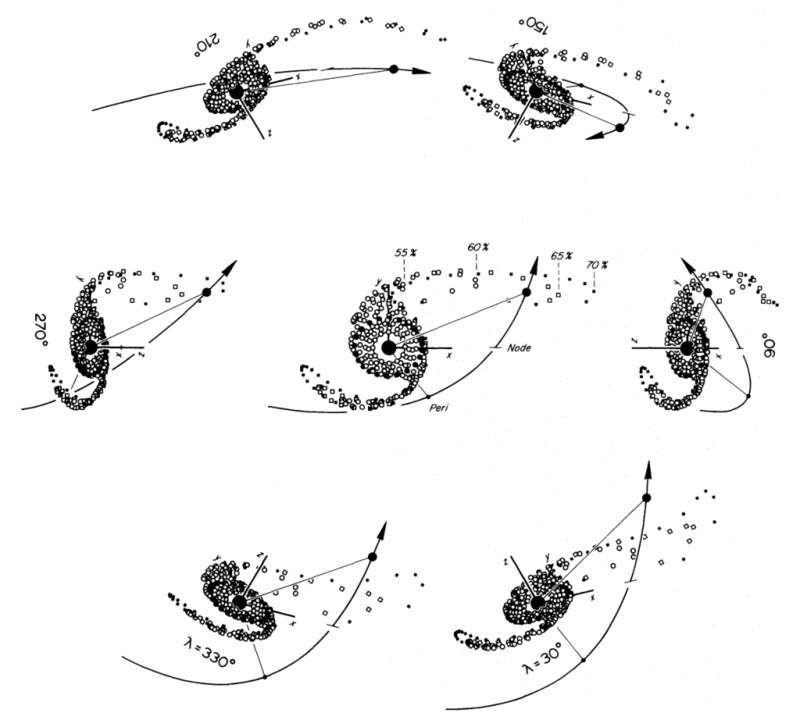 The paper explores the effect of one galaxy passing close by another. It’s full of insight and ideas fascinating in their own rights, but whilst reading it struck me — as proud of these authors are of their results, their proudest achievement is the aesthetic. The paper is filled with stunning illustrations, exploring these galaxies not as flat images or mathematical concepts but tactile objects. Suddenly, they can pivot and tumble the galaxy at will, as one might idly do with some interesting curio absentmindedly plucked from a friend’s coffee table. The simple concept is to take a disk of particles, orbiting a central mass like a child’s toy model of a disk galaxy. Then they fling another mass past, letting it tug at the particles, pulling them free of their ordered paths and flinging them away, hoarding all it can capture and leaving the disk shrunken and distorted. Stepping through time, we see an incoming galaxy, equal in mass to the first, tear particles out of the disk, scattering all but the closest most tightly held stars. 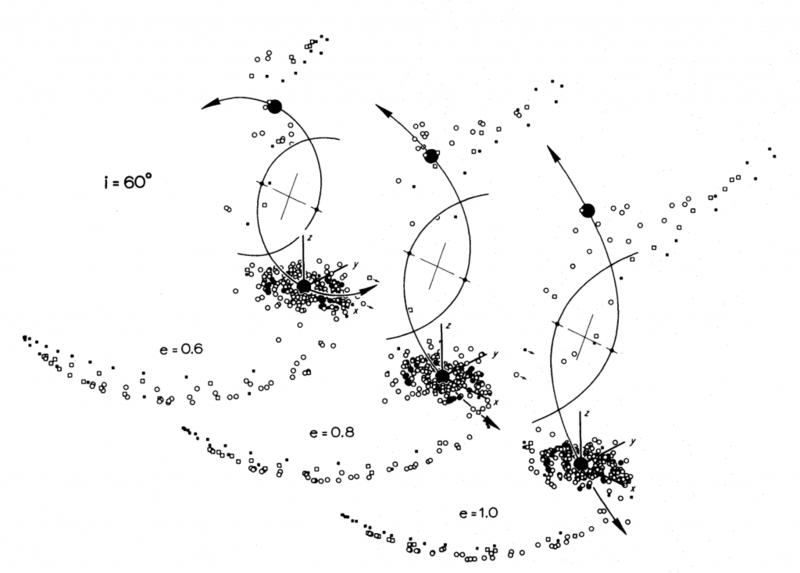 This simple model of a galaxy merger, a chance collision between two huge astronomical bodies, is modest by necessity. They ignore the disk around the interloping galaxy, they ignore the pull of each disk particle on another, they build a galaxy of maybe trillions of stars from a few hundred particles. All this prudent simplicity makes the the task feasible for a era of computing that was still two years shy of Pong. But it’s also where much of the aesthetic and scientific beauty stems from. A system too multi-faceted for a pencil and scrap of paper, but small enough to be visible in its entirety. A complex system to be completely understood. Much like an artist changing palette and brush, simple and subtle changes to the simulation produce new enthralling profiles to peruse and tease out understanding from. The same collision as above, but now the incoming mass goes against the spin of the disk rather than with it. As it flies past particles speeding in the other direction, it barely has time to drag them away, and whilst the eventual disk is distorted, this simple change has kept it from being torn asunder. Scrolling through their images, something I encourage you to do, there are hallmarks of something too rarely seen in academia. Play. There’s a real joy in it, image after image of slow catastrophes. Each strewn across the page in a reckless swirl, known to be useful and believed to be beautiful. From their various simulations they draw a series of insights that are still the foundations of the field today. They show that whole families of the eclectic mess of galaxies we see in the night sky can be explained by galaxies merging. 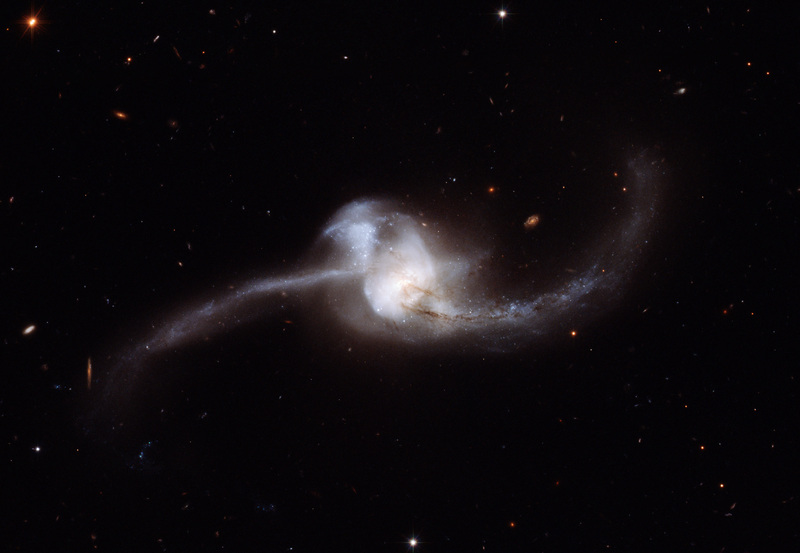 Long tails sweeping behind galaxies and sinewy bridges between them can all form in the chaos ensuing from the collision of two galaxies. In over 40 pages, spanned by over 20 such images, they carefully pick apart every detail they can from their simulations. Their understanding, as visual as it mathematical, comes not from a surplus of data but a sparsity. It’s a heady power to explore an object, once just a flat smear on the sky, as a 3D toy whose history can be tailored to specification. Their careful and complete analysis, and the joy they take in it, make this a landmark work and stand in stark contrast to the simulations they fathered. Modern computational astrophysics uses a glut of computational power to mix and meld hundreds of physical effects into complex and inscrutable pseudo-universes. The results are just as beautiful, maybe more so, but the idea of exploring them in their entirety is long retired. What a curious thing it seems to explore every corner of your data until each little detail clicks into place. To play detective in the galactic ballroom until every step is mapped out and the culprits picked out from the expectant crowd. It’s worth remembering where the impact of a paper like this comes from: a full, unabashed investigation into a new world of unexpected and joyful beauty, and its own reward. I can’t recommend enough scrolling through the original paper. Each image I find a surprising delight, astonishingly artfully composed. These three sisters are the same galaxies, at the same moment, during collisions differing only slightly in their energy and approach.